This talk is open to MIE faculty and graduate students. Registration is not required. Several insect species, such as diving flies and diving beetles, exhibit remarkable locomotive capabilities in aerial, aquatic, and terrestrial environments, inspiring the development of similar capabilities in robots at the centimeter scale. In this talk, Kevin Chen will present two insect-scale robots capable of multimodal and multiphase locomotion. He will start by presenting a 175mg, flapping wing robot that can hover in air, swim underwater, and impulsively jump out of the water surface through combustion. He will also introduce a 1.6g, quadrupedal robot capable of locomotion on land, on the surface of water, underwater, and between these environments. These results demonstrate that microrobots can achieve novel functions that are absent in larger, traditional robots, thereby showing the unique potential of microrobots in applications such as inspection and environmental exploration in cluttered spaces. He will further discuss major challenges and future directions in microrobotic research. Towards developing a swarm of robust and multifunctional insect-scale robots, he is working on creating a new class of microrobots – ones that are powered by high bandwidth soft actuators and equipped with rigid appendages for interactions with environments. 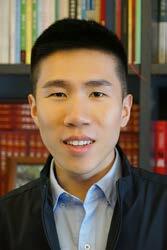 Kevin Chen is a postdoctoral fellow at the Microrobotics Laboratory and the Materials Discovery and Applications Group at Harvard University. He received his PhD in Mechanical Engineering at Harvard University under the supervision of Professor Robert J. Wood. His work focuses on developing insect-scale robots capable of locomotion and transition between air, land, and water. His research interests also include developing high bandwidth and robust soft actuators for microrobot manipulation and locomotion. Kevin received his bachelor’s degree in Applied and Engineering Physics from Cornell University. He is a recipient of the best student paper award at the International Conference on Intelligent Robots and Systems (IROS) 2015 and a Harvard Teaching Excellence Award. He is recently named to the “Forbes 30 Under 30” list in the category of Science.